Here’s a pasta salad recipe that you can indulge in while still getting flat abs! 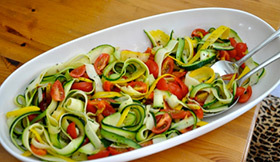 The secret is to use a vegetable peeler to turn zucchini into long pasta-like strands. This recipe is filled with fiber and is the perfect side to a lean chicken breast. Don’t skip your workouts, regardless of how busy you are. Make it a priority. Schedule your workouts the same way you do every other important activity…and then do them when they are planned. Buy that brand new bathing suit or outfit in the size you plan on beaing. Then hang it up where you’ll see it everyday. Talk about motivating! Open any running book and flip to the chapter on mileage. You’ll inevitably find that the 10 Percent Rule is recommended for runners who want to run more. The 10 Percent Rule states that you should only increase your weekly mileage (or volume) in increments of 10 percent. So if you are running 30 miles this week, you should only run 3 more miles next week. There are smarter ways to increase your volume. Are you being too conservative with your mileage? Are you being too aggressive? Does your training program have the right ancillary exercise to help you prevent injury? 1) If you’re a beginner, forget the 10 Percent Rule. As someone learning how to start running, your main priority is to run consistently and allow your body to get used to running. Two or three days of running 1 to 4 miles works well depending on your fitness level. Don’t increase your mileage every week; instead, keep it consistent for two to three weeks to allow your body to adjust. When you’re comfortable, then you can run more. If you run three days per week for 2 miles, 3 miles, and 3 miles and you’re ready for more mileage, you can add another day of running. Simply add another 2 miler to your schedule. Even though this is a 25 percent increase, it’s entirely safe provided you were comfortable with your previous volume. Stick with your new running schedule of 10 miles for another two to three weeks, and then consider an additional jump. 2) Determine your mileage sweet spot. Runners with more experience will find that they have a mileage sweet spot. This particular volume will be comfortable for you but running more will be a challenge. You may find yourself overly tired, prone to injury, or running poorly in workouts. Let’s take a hypothetical runner who finds 25 miles per week easy. We’ll call her Meaghan. She can jump up to this volume quickly and get in fairly good shape. But to reach big goals in longer races, like qualifying for Boston, Meaghan may need to run 35 or 40 miles every week. This is where she may run into (pun intended) problems. The injury potential beyond her mileage sweet spot of 25 per week is much higher. To help Meaghan stay healthy, more conservative mileage increases of only 5 percent are more appropriate. She should also maintain her volume for several weeks instead of running more every week. 3) When you’re coming back from a brief break in training, skip the 10 Percent Rule. Let’s talk about Meaghan again. If she takes a week off from running, she is not starting from scratch. She can easily start running 15 to 20 miles per week and quickly increase to her sweet spot of 25 miles. If your break from training is longer than two weeks, you may want to be more cautious with increasing your mileage. Start at a conservative level and increase your mileage by 10 to 15 percent every two to three weeks. 4) Be more conservative when you’re in unchartered territory. When you start running more than you have ever run before, you’re in a potential danger zone. Your body has never run so many miles and a long adjustment period is probably necessary. At least two to three weeks of the same mileage might be necessary before running higher volume. Ultimately, your mileage takes a backseat to the consistency of your training. Running an extra 5 or 10 miles next week isn’t meaningful unless it’s done for months. Instead of always trying to do more, try to run consistently. Be patient and gradually increase your volume over months and years (not days and weeks). There’s no magic number that will make you accomplish your running goals. Focus on consistency, not making stupid mistakes, and only moving up your mileage when you’re ready and comfortable. You may find yourself increasing your volume more or less than 10 percent, but in the end, always listen to your body. High fiber foods are nutrient dense and low in calories. This means that you’ll feel full from fewer calories, encouraging weight loss. Get a minimum of 25 grams a day with these high fiber favorites: spinach, raspberries, pear (with skin), artichoke, peas, apples (with skin), broccoli, Brussels sprouts, and carrots. Check out the high-fiber recipe for pasta salad below. Lean protein helps support muscle growth while controlling blood sugar – all important factors when it come to washboard abs. Aim to eat .6-.8 grams of protein per pound of body wieght from these good sources of protein: chicken breast, turkey, lean red meat, egg whites, ocean caught fish, tofu, beans(also high in fiber). Hanging Leg Raises are one of the most effective ways to strengthen your abdominals. Holding the weight of your body strengthens your grip as well shoulders and upper abs, while raising your leg (or knees to start) rips the lower abs. 1) Hang from pull-up bar with legs fully extended. 2) Exhale and drive your knees up toward your chest. 3) Inhale as you slowly lower your legs back down. Step Eight: Stop Eating Refined Sugar. If you only did this step, and skipped all the rest, your abs would look significantly flatter by summer. I can’t emphasize enough how quickly sugar will cover your hard earned stomach muscles with a soft layer of fat. Step Ten: Pass On The Starchy Grains. Sure, whole grains are being touted as essential to a healthy diet, but the truth is that you’ll do just fine without them for a while. Even the heartiest wholegrain bread will encourage fat storage, so put down the breadbasket as you prepare for beach season. Step Twelve: Hydrate. One of the easiest and cheapest things you can ingest to help you become/stay fit and healthy is water. Staying properly hydrated (half your body weight in ounces every day) reduces cravings, reduces the amount you eat at feedings and helps make sure your muscles perform optimally during all your calorie burning workouts. Figure out your system to track water (I like a gallon jug that is filled every morning and has to be empty by bedtime) and make sure you stay properly hydrated every day! You wouldn’t try to file corporate tax returns without the assistance of your CPA, so why would you attempt to transform your body without the help of a professional? I’m here to get you into your ideal, fit body in the shortest amount of time possible. It’s what I do, and I’m good at it. 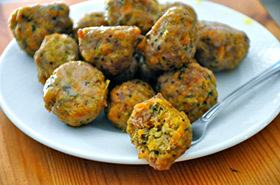 These meatballs are packed with protein and veggies, making it the perfect snack, breakfast, lunch or dinner. Make a quick batch on the weekend, and then enjoy throughout your week. 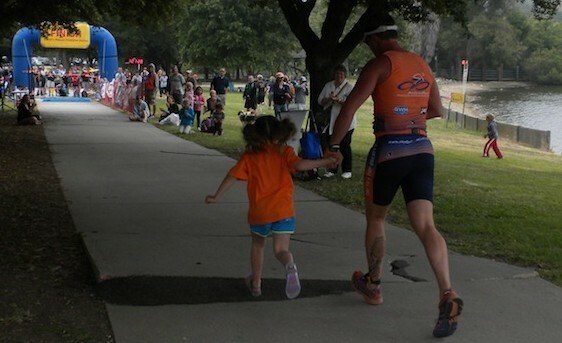 Triathletes need the ability to settle into a steady pace and swim a long distance during a race. The goal of these two sets is to take that steady pace and make it faster! Before launching into the workouts, you need to know the two biggest mistakes that can be made in these workouts. The first error is not going fast when it’s time to go fast. You must have a noticeable difference between your steady pace and your fast pace. The second error is reducing the amount of recovery between swims on the first workout. Triathletes often feel that the least amount of rest during a set, the better. Not this time. You need the recovery so you can go fast. Depending on your fitness, swim speed and training time available, do three to five repeats of the set below. Before beginning, select a swim interval that is your current steady pace time, plus 40 seconds. For example, if your current steady pace is 1:40 per 100, the swim interval will be 2:20. That means leaving the wall every two minutes and twenty seconds. Actual rest time will vary depending on swim speed. #1 – Swim 75 at your current steady pace, then 25 FAST! #2 – Swim 50 at your current steady pace, then 50 FAST! #3 – Swim 25 at your current steady pace, then 75 FAST! #4 – Swim 100 FAST! Repeat the next round once or twice. Recover 10 to 15 seconds between swims. Before beginning the main set, select a swim interval that is your current steady 200 pace time, plus 20 seconds. Notice that the swims are longer than in the first workout and the rest is shorter. Your “fast” won’t be quite as fast for this workout as it was for the first one. That’s okay. Just be sure there is a noticeable difference in speed. For example, if current steady pace is 3:20 per 200, swim interval is 3:40. That means leaving the wall every three minutes and forty seconds. Actual rest time will vary depending on the swim speed of each 200. Take 1 full minute of rest and go right into 100s. Select a swim interval on this one that is 15 seconds over your steady pace. For example, if your current steady pace is 1:40 per 100, your swim interval will be 1:55. Depending on your goals and fitness level, repeat a second round of the 100s. Note: Thanks to swim coach Doug Garcia for the main set. Be sure to go into these swim sets relatively fresh. If you are wiped out from previous runs, bike rides or life chores it is best to just do an easy swim and come back to these workouts later when you can go faster. Here’s a slice of cake that won’t mess with your brain chemistry. The wholesome and lightly sweet flavor will satisfy your sweet tooth and power your day with real energy. Taylor Phinney’s solo ride during the Tirreno-Adriatico on Monday. But this story is better than that. First, about Taylor Phinney. Remember that name. You might already know it. Bike racer from Boulder, Colo., 22 years old. The son of two cycling legends, Davis Phinney and Connie Carpenter. A big dude on the bike, at 6 feet 5 inches, 180 pounds, Taylor Phinney is one of the most promising young cyclists in the world. He’s already been to the Olympics twice. Won a stage of the prestigious Giro d’Italia last year. He is expected to have many great days in the sport. Monday didn’t begin like one of those days. Phinney was competing in Italy’s Tirreno-Adriatico stage race, and this penultimate stage was a doozy. Up and down, down and up, 209 kilometers of punishment, including a 27% climb so comically steep that some riders got off their bikes and pushed them uphill. Many riders quit. Later the race organizer would admit that the stage was too difficult, even for elite pros. Phinney didn’t expect to win this stage. He just wanted to hang around, because the next day brought a time trial against the clock, and Phinney had a chance for a good result in that event. But the day soon unraveled. His legs weren’t feeling great, and then his bike busted its chain. He had to get a replacement and chase his way back to the pack. Bike racing is a sport that fetishizes suffering. Anyone who’s done it talks almost mystically about painful days on the bike, about the serenity achieved by pedaling through the agony. But even the best can only take so much. Soon Phinney found himself in a small group of 30 or so riders who had fallen off the main field, with about 130 kilometers, or 80 miles, left. The riders in the group began talking. Phinney said it became clear that nobody wanted to finish. Drop out now, get out of the cold. This is no shame. It happens all the time. Fight another day. But Phinney wanted to fight now. He had to complete the race under the time limit to do the time trial Tuesday. “If I wanted to finish the race, I was going to have to do it by myself,” he said. So that’s what he did. 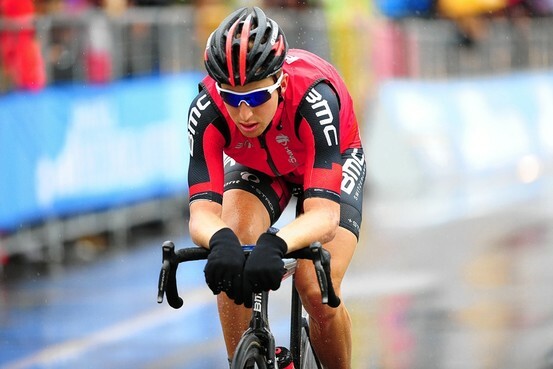 As the rest of the group abandoned the race, Phinney put his head down and pedaled. He was suddenly alone. The weather was miserable. It began to rain. And Phinney kept thinking of one thing. “I would just think of my dad,” he said. Davis Phinney has lived with Parkinson’s disease for more than half of Taylor Phinney’s life. One of the great American racers of all time, a Tour de France stage winner and Olympian, Davis’s day is often met by frustrating physical challenges. Tasks that were once simple take so much longer. Ordinary life requires patience. That’s what kept his son pedaling in the cold Italian rain. He had so many miles to ride. “It’s kind of embarrassing,” he said. “The race has gone by, and people aren’t really expecting one rider slogging along by himself.” Fans on the side of the road offered to push him up hills. But Phinney remembered a story his Dad had told him about one of his old Tour de France teams, making a pact to decline pushes. Taylor would do the same. No pushes. “He wanted so badly to finish the race,” said Phinney’s teammate, Thor Hushovd, a former world champion. Hours later, Phinney crossed the line, exhausted. He finished almost 15 minutes after the second-to-last rider, thirty-seven minutes behind the winner. He didn’t make the time cut for the day, which meant he couldn’t compete in Tuesday’s time trial. It was a bummer, but Phinney was too zonked to be devastated. During his post-race massage, he cried like crazy. On Twitter, Phinney wrote about riding for his Dad and called it “probably the most trying day I’ve had on a bike.” When Phinney’s saga was reported on the website Velonews, cycling fans went crazy. These have been bleak times for the sport, ripped apart by doping scandals. Phinney’s solo effort—and his emotions post-race—had stirred something soulful. “Emotion is powerful and undeniably human,” Phinney’s mother, Connie Carpenter, said in an email from Italy. Back home in Colorado, Davis Phinney was marveling at the whole story. You can still find Davis on his bike, usually on the fancy carbon-fiber city commuter he got from his son. Cycling remains a sanctuary—”easier than walking, in a sense,” he said. But the daily routine remains full of hassles. Davis Phinney keeps a sense of humor about it, jokingly referring to himself as “Turtleboy.” He began a foundation to give people living with Parkinson’s tools for living well—for achieving little victories. Davis Phinney said he didn’t learn about Taylor’s ride until after it was over. Friends told him how inspired they were by his son. When he heard that Taylor had been thinking about him the whole time, he was floored. You make me so happy and beyond proud—and that is better than any medicine and can defeat any disease. The results are wrong. This is not a story about a guy who finished last. Taylor Phinney won that race. Wholesome, home baked goods: When a piece of fruit just isn’t going to cure your cake craving, then make a wholesome, gluten and cane sugar free cake at home. 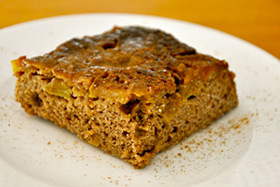 The Caramel Apple Upside Down Cake below contains wholesome fat from coconut oil and almonds that will keep you satiated for hours.